Prep your vehicle for maximum shine! Pinnacle XMT Speed Clay rids your vehicle of impurities to create the cleanest possible paint finish. This flexible clay bar removes contamination that washing leaves behind, creating a smooth-as-glass surface in preparation for a flawless coat of wax. Pinnacle XMT Speed Clay is a key step to achieving the ultimate high gloss finish. If you've never used detailing clay, then you haven't seen the your vehicle's true potential! Fine contaminants firmly lodge in the paint surface, resulting in a gritty texture and patchy appearance. Rail dust, industrial fallout from factories, and brake dust may be invisible to the naked eye, but their combined effect detracts from the paint's overall gloss because light reflects unevenly off the dirty paint. Pinnacle XMT Speed Clay safely removes paint impurities. Afterwards, light reflects evenly off every curve of your vehicle. Wax bonds better with the clean paint, and your vehicle feels silky smooth. Only detailing clay leaves automotive paint truly clean. Only Pinnacle XMT Speed Clay. Detailing clay was invented in the late 1980's just as clear coat paint became the standard automotive coating. Clear coat has a wonderful gloss and reflectivity but it does require special care. Paint contamination has always occurred but on single stage paint, you could literally polish off the outermost layer of paint. 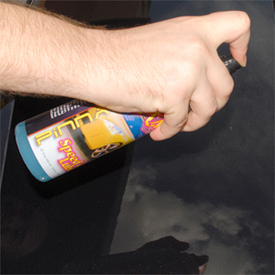 Clear coats require a lighter touch to maintain that micro-thin clear coat layer. Detailing clay emerged as the safest, most effective way to clean clear coat paint. Over the years, detailing clay has become more and more advanced. Today we have Pinnacle XMT Speed Clay. This ultra elastic, totally synthetic clay bar is highly flexible, durable, and non-abrasive. It is the easiest and most rewarding way to deep clean automotive paint. Detailing clay works by mechanically removing visible and invisible contaminants from the paint. As it glides over the finish, clay grabs impurities and traps them within the clay. By using a clay lubricant, this process is totally safe and non-abrasive. Cleaners try to dissolve impurities with acids. Polishes contain abrasives that may not be necessary. Only Pinnacle XMT Speed Clay removes paint contamination safely and quickly with no harm to the paint. Pinnacle XMT Speed Clay is just as important to the health of the paint finish as it is to the appearance. Gritty particles that penetrate the paint are detrimental. Many of these particles are metallic. As they oxidize, the oxidation spreads throughout the clear coat. One tiny pinpoint of rust can turn into a large patch in months. Prevention is as easy as using Pinnacle XMT Speed Clay twice a year. After using Pinnacle XMT Speed Clay, your vehicle will feel as smooth as glass and have an improved gloss. Your favorite wax or paint sealant will bond better with the paint, and it may even last longer. Pinnacle XMT Speed Clay can be used on glass and metal, too. 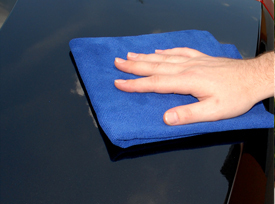 Airborne contamination grabs onto all automotive surfaces. Regular use of Pinnacle XMT Speed Clay will keep paint, glass, and metal looking clean and feeling glassy smooth. Your vehicle isn't truly clean until you use Pinnacle XMT Speed Clay. First mist the paint with XMT Speed Clay Lube. Rub the clay bar over the lubricated area until it glides freely. On a clean vehicle, spray a 2 x 2 sq. ft. area with Pinnacle XMT Speed Clay Lube. Gently rub Pinnacle XMT Speed Clay back and forth across the wet area. It will grab initially as it works to remove contamination. When the clay bar glides easily, the paint is clean. 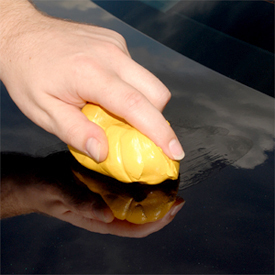 Use a Microfiber Detailing Cloth to wipe the paint dry. If any clay residue exists, mist the paint again with Pinnacle XMT Speed Clay Lube and wipe dry. Continue this process until you have clayed the entire vehicle. Remember to reshape the clay bar often to reveal a clean portion. After claying, always apply a fresh coat of wax or paint sealant. Wipe the paint dry with a soft, clean microfiber towel. Always use a clay lubricant. Pinnacle XMT Speed Clay Lube allows Pinnacle XMT Speed Clay to glide over the paint easily, and it protects the paint from the fine particles being removed by the clay. Use Pinnacle XMT Speed Clay on a clean vehicle. Prewash the vehicle to remove loose contamination so it doesn't "clog" the clay bar. Use clay before polishing. If your vehicle is in need of polishing, clay first to remove any gritty particles. If you don't these particles will come loose during the polishing process and they'll become "accidental abrasives". They may leave swirl marks even if your polish doesn't. Of course there's always an exception to the rule! If your vehicle is heavily oxidized to the point of paint coming off, polish before claying. The reason is that paint flakes will overload the clay, making it perform poorly. Fold and refold the clay bar often. 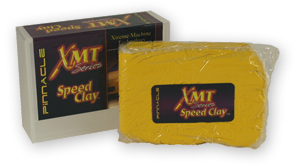 The beauty of Pinnacle XMT Speed Clay is that you can renew the clay over and over. When the clay appears dirty, fold it until you see clean clay. It's safe to keep using the same clay bar until it has no clean surface area left. Use Pinnacle XMT Speed Clay up to twice a year. As long as your vehicle is waxed regularly, there's no need to clay more often. Easily cut into smaller easy to use pieces which makes it a great value for the price. For some reason no matter how much detail spray you use it constantly sticks to everything it touches including your hands!! ProsBig value. Can be cut into smaller pieces. ConsVery very sticky. Different than every other clay I have used! The clay bar arrived a few days after placing the order and is a great value, considering bars less than half the size are only sold with cleaning liquid for $10.00, as a rule, more than AutoGeek's price. This was the first time I ever tried using detailing clay, so I don't know how it compares with others, but it worked great for my purpose. I have a truck that has gone about 4 years nice the last time it was waxed and every surface had road grit embedded in the clear coat (I drive on sand covered New England roads). I went over the truck with about 1/3 of the clay bar and the grit is all gone. The body panels are super smooth when you run your hand across them and there are no scratches from the clay. The truck is ready for wax. Compared to other clay's it seems to stick & crumble. ( Yes I am using enough spray.) I prefer Meguiars.